You must make reservations at least 5 minutes in advance of the time at Wisteria. They cater small intimate affairs. 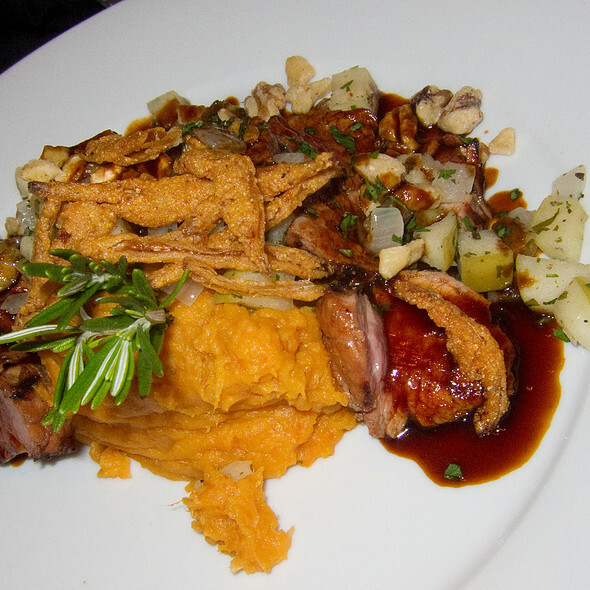 Wisteria serves American cuisine with a Southern twist in an intimate sophisticated setting. The restaurant is a hundred year old space featuring an extensive wine list and an engaging and knowledgeable wait staff. Specialty dishes include Molasses Rubbed Pork Tenderloin and Iron Skillet Chicken. This place is incredible. The food was so delicious, I'm planning my next trip back already! The collard greens were the best I have ever had in my entire life, and if my grandmother found out I said that over her greens, oh...lord help me. We were seated in a very timely manner. The food quality was ok. I ordered the mussels and a side of mushrooms. There was bread for the table, but it was pretty dry. Only complaints were that my side plates were never cleared and I had to ask for an extra bowl for the mussel shells. Another wonderful evening at Wisteria. 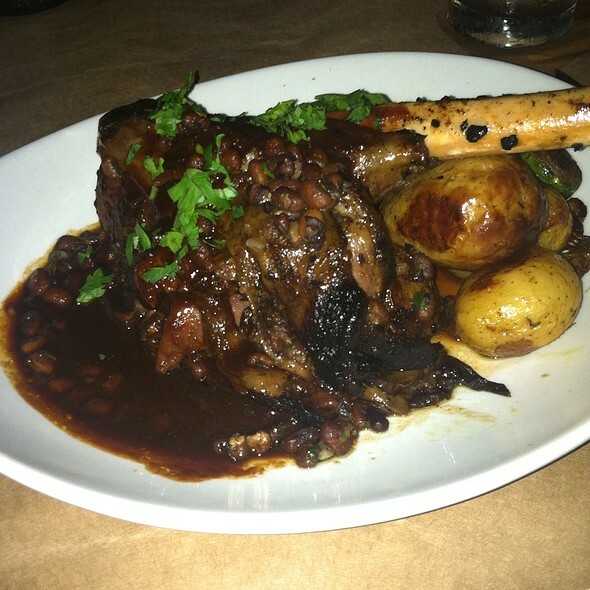 Energetic ambiance, delicious food and attentive service. Good wine selection to pair with any item on their wonderful menu. Wonderful food and wait staff was great! Parking was very easy and free/low. Love Love Love this place! Every single time! It's great for meet ups with friends. In a neighborhood full of wonderful restaurants this is my favorite. Such a warm homey feeling here and the food/service is always fantastic. Nice experience. The bartender was friendly. The waiter was okay but the food made up for it. We did the INMAN park restaurant week menu. My friends catfish was not cooked all the way so they friend her a new one. Other than that it was a nice experience. Food and service were good. A bit rushed at first, but once we told the waiter we weren’t in a hurry, the pace slowed. 8 of us went for dinner to celebrate 2 birthdays. 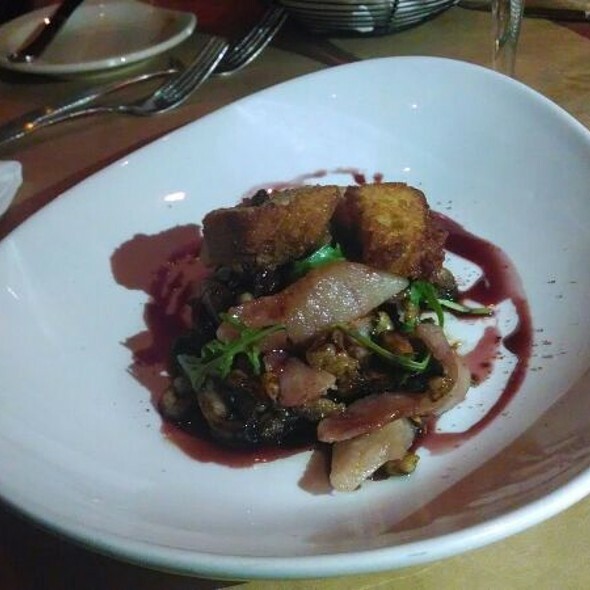 It happened to be Inman Park restaurant week, which made it even better. Most of us ordered off the fixed price menu and thoroughly enjoyed it. Delicious meal capped off with an amazing dessert taster. We will be back. Always an wonderful experience here! The staff and food are just amazing! Wonderful food and service . A bit noisy though though. Always delicious! 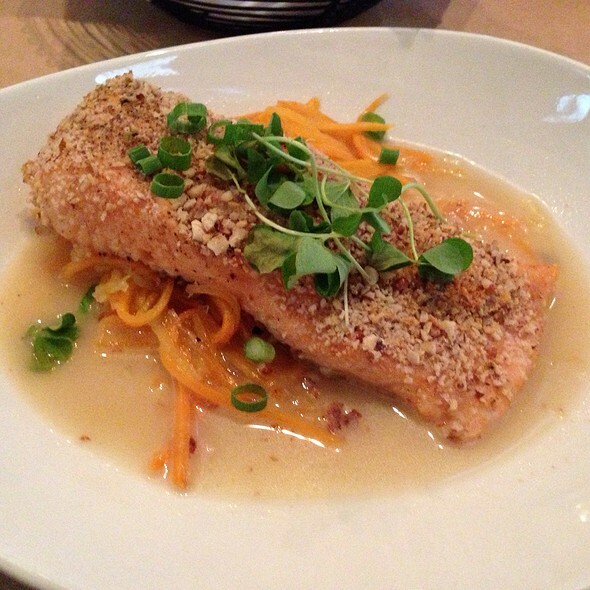 We especially like to come during restaurant week. 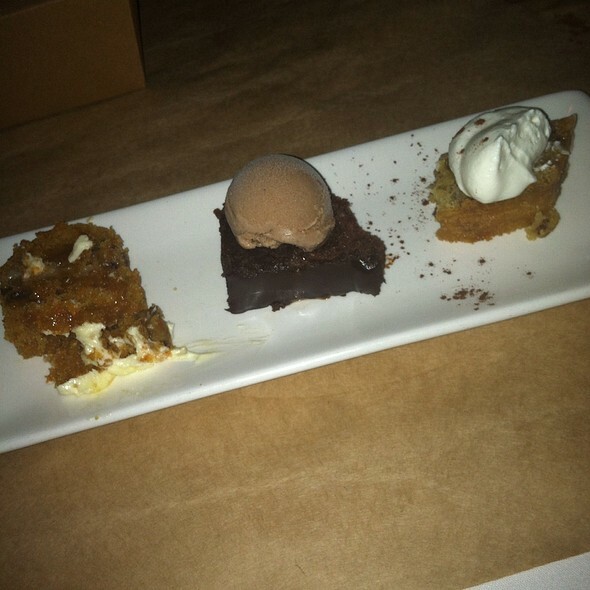 I had the crab cake, fried chicken, and the assorted desserts from the chef. Can’t beat it! Fantastic food, location, drinks and staff. Everything was wonderful. I recommend the fried quail! Our server was knowledgeable and friendly. Great recommendations. This has been one of our favorite restaurants for some time. I've never had a bad bite at Wisteria. Always a great dining experience. My friend and I had a wonderful meal! We shared a beet salad and a plate of mussels and a trout almondine main course. Everything was great. We also both had a glass of wine. I'll definitely be back. Always reliable, great for guests, I love this place. I have had no trouble with managers or wait staff, quite the opposite, they were extremely personable and attentive. We had the aroncini, the gnocchi & meatballs, and the lamb Salisbury steak. They accommodated my substitution request (for a low carb side). I've never seen my dinner guest eat all her food, so it was a big hit! It was so loud we could not even talk. We had reservations and they sat us at a table that they just stuck in a space it did not fit in. Servers were knocking into us. They moved us there after the first table was so loud we could not hear at all. Would not move us out of the walkway to other tables that were vacant. Fried chicken was soggy. The bill for four people was close to $300. The waitress was not very good and left us sitting there for a long time without drinks or taking our order. I will never go back. I have been to the restaurant before and liked it, but it is not the same. In an almost empty restaurant we were seated in the rear corner about 12 inches away from another couple with five empty tables to the other side of them. For their sake and ours we requested to be moved but felt like the manager was a little snippy about it. I had the meatball gnocchi- which seemed a bit too Chef Boyardee for the $28. We've liked this place in the past but this was our last visit. Another great meal at Wisteria!! Excellent service, creative chef specials and wonderful food. It was the perfect place to catch up with great friends. Our table was reserved for 7.15pm. It was not available for 30 minutes. Our waitress could be described as having a charisma bypass. Never smiled and not very friendly. Other than that a good meal in a nice restaurant. Wisteria finds a decent price point while providing a high-end dining experience complete with excellent service and a true chef-driven kitchen. Expect to pay between $20 and $40 per entree. We brought picky friends from the west coast to show them what modern, local, southern(-ish) food is like. We were not disappointed! Our waiter patiently and enthusiastically explained it all (e.g. what is a hush puppy?) with good humor. From the tangy salad with house dried cherries and deviled eggs with trout to the traditional fried chicken skillet with collards, our guests got a very satisfying taste of what we're always talking about. The amazing vegetable plate that includes all the sides of the day, the dessert sampler and the special of the day (Atlantic cod perfectly cooked) rounded out a great dinner. My boyfriend took me here for my birthday and everything was excellent! I had been wanting to try this place out because it is next to one of my favorite brunch restaurants (Folk Art) and I’m so glad we went here. Every dish we ordered was perfect. I got banana pudding for dessert and it was just as good as the banana pudding my mama makes AND since it was my birthday they brought it out with a little birthday candle and it was free, not that I was expecting them to do that for me but that was a really nice surprise. Sure, the food is a little pricey but I feel like it was worth it for the experience and the atmosphere. Definitely good for a special occasion or date night dinner! In looking at the menu, there were so many items in the Starters section, we decided to get 3 of those and split an entrée. We got the sweet potato hushpuppies, cornmeal calamari, and the black-eyed pea hummus. The hushpuppies were good and came with a sorghum ketchup that was delicious. The calamari was really good and included fried okra and onions. The sauces with that were excellent. The best item was the black-eyed pea hummus which was served with sweet potato chips. Don't miss out on getting that. For our entrée, we split the fried chicken. 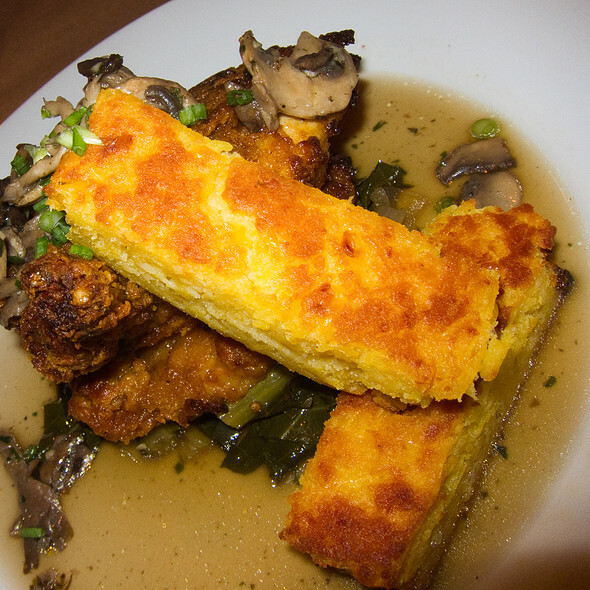 It was delicious and came with collard greens that were tender and flavorful. This was our anniversary, so when we sat down, they brought us each a glass of champagne which was a really nice touch. OK, it is the Florida cheering duo for Wisteria. Once again we are in ATL for business. Once again Wisteria is the first dinner of our stay. I repeat every other review I have written about Wisteria: come here for delicious food, enjoy the urban chic setting and get into the upbeat mood of the diners having a good time. 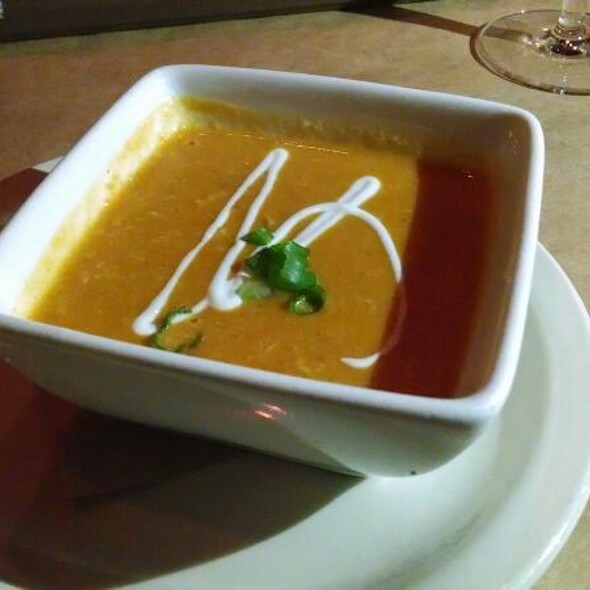 We looked at the menus tonight, looked at each other and simultaneously said “we have tasted and enjoyed everything on the menu.” My husband said the bisque was superb and it is one of his favorite appetizers here. I enjoyed the arugula salad and loved the touch of the grilled apples. Would have loved the apples even more if the were freshly grilled and served warm with the cold and crisp arugula. The pork tenderloin was as outstanding as always. Wisteria, you always start our week in ATL on a high note. Thank you. I love Wisteria. The only complaint I can even think of is that it is really loud. The food & service were excellent. Our waiter (Mitchell) was great! We enjoyed our meal & the evening. We were seated in a quieter corner table which was nice for my father who is hard of hearing. The food was excellent with the exception of slightly over cooked shrimp in shrimp/grits entree. Server was attentive and informative. We really enjoyed interacting with him. Love the ambiance of this restaurant and the cozy feel. Very pleased with our experience and would return again! Was worth every penny. I took my wife here for her birthday and the ambiance and the food was spectacular. I would recommend to everyone. Very welcoming and delightful restaurant. The space is beautiful without being stuffy. It feels like a special occasion and neighborhood place at the same time. A place you’d go to celebrate, but also a place you’d go at the end- or in the middle of- a long week. Pleasantly abuzz without being overly noisy. Looking around, everyone seemed to be having a great time. The service is excellent and very professional, but not at all pretentious. The food is interesting and delicious. The drinks are excellent. Wisteria manages to hit every high/low note for a place I’d go for a special night, but also every night. Service was excellent! Menu choices were amazing and the food was delicious!!!! highly recommend this place! We were seated next to the window and there was a bit of a draft. Window gaps to outside air became more obvious when people outside decided to smoke directly in front of the window and the smell of cigarette smoke flooded our table. Fortunately they didn’t smoke for very long; just providing feedback so owners are aware as could have been an issue for us if they had lingered for a period of time. The food is wonderful. However, the place is cramped with tables and very loud. But the food is wonderful so I overlook those faults. Our server Jim made our experience! We will go back and hope to see him again. He was so attentive and extremely genuine. Food was good. Tables are close together. It was 6:30 but still noisy. Not ideal for intimate dinner. Such a nice restaurant.